The House of Dra uses a custom woven non-defoliated organic cotton that is preshrunk and machine washable. These garments surround your body in cool softness and are sewn to last. 40+ years creating quality garments these are the most comfortable clothing on the Planet! Find us on Facebook WenchesAtWork and "Like" us as a Small Business! Also on Facebook as the HeadWench -- more chat related. Well, ,I hope everyone is ready for Spring! We've been sewing like mad women and look forward to bringing some new designs and beautiful new fabrics made into garments just for you. Our Made in the USA Renaissance clothing is perfect to wear at Faires and Festivals, comfortable at home, to work or relaxing in. The Organic Cottons are great to pack for your Cruise and Beach Wear. Shop our menu's on the left to create your perfect Outfit. Renaissance Gowns, Comfortable Organic Cotton Clothing and traditionally created Kilts for young men "growing into it" up to Adult sizes. Ladies, Wenches At Work makes beautiful, easy care machine wash and dry Renaissance Gowns, Blouses and Tops, Bodices, and Chemises for smaller ladies along with 8-Panel Skirts. House of Dra creates Chemises for Full-figured ladies, Circe and Petal Skirts (shown above in white with tabacco layered), and a variety of blouse styles. All created from her special woven organic cotton that is delightfully cool to wear. 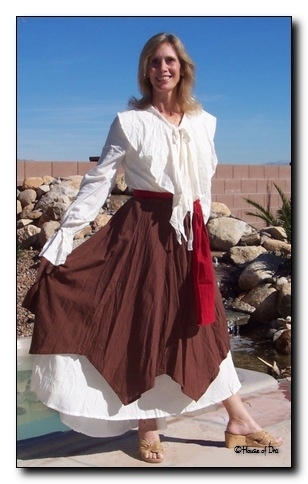 Men, Wenches At Work makes Pirate and Cavalier Shirts, Pirate Pants, Vests and Reversible Doublets. Our Kilts are woven according to the official Tartan Registery and we carry the most popular tartans at great prices. We offer A "good kilt at a good price" and traditional Belted Kilts at very reasonable prices. Whatever your price range we have a KILT for you. Looking for a special tartan? Our weavers minimum is 300 yards (sews into approximately 30 kilts). These special orders take 3-4 months so Contact us with enough lead time before your event or clan gathering. House of Dra offers a large selection of quality sewn Men's shirt styles in 100% cotton, Wrap Pants and Baggy Pants with pockets (called Gorky's). Capes - We carry long, hooded Capes in Black Buttersuede in 3 different heights. Machine washable, roomy inside our Medium is sized for 5' tall, our Large for 5.5' and our XL length is 6' draggin on the ground length. Renaissance clothing in sizes Small to 4XL but check items as all sizes are not available in every item. Sale items are non-refundable. These items are limited in stock so check size chart prior to ordering. SHIPPING - Our Standard Shipping is Priority USPS 2-3 day. Texas Renaissance Festival (House of Dra) -- Just Finished Huzzah! We support TNR of feral cats through our sales. Ready to adopt a friend? In the Cleveland, Ohio area? Please think of Holy Cat Whiskers Rescue! They need help getting a new home for their rescues. Please donate Holy Cat Whiskers 2641 Hubbard Rd.Madison 44057. The Meowers will be forever Greatful. In Minnesota please contact Last Hope Rescue, this is truly some animals Last HOPE up in the cold and snow! In Tucson, Arizona contact F.A.I.R. Or Casa de los Gatos -- Both groups I have fostered animals for, raised funds with a community yard sale, Made a full Cat and Dog Suit for... Both wonderful animal loving No-Kill rescues! In the Houston area you will find your new love at the Abandoned Animal Rescue in Tomball, TX. Another group that I just adore! They help with spay/neuter of ferals I would trap, we (Dra and the Head Wench) raised funds selling Cat Skirts at the Texas Renaissance Festival -- Great group of dedicated folks. Wenches At Work also carried Professional Belly Dancing items and Tribal Wear Accessories. These can be appreciated at the Wenches At Work -Home of Dra shops in Ohio and Minnesota. Due to the sheer weight of some of these items, I haven't listed them on our website, but these are hand-chosen, stunning Tribal belts, Beautiful Afganistan Lapis and heavy Kuchi Belts. If you have problem checking out please Contact Us. Copyright © 2005-2013 The House of Dra - Wenches At Work. All rights reserved.